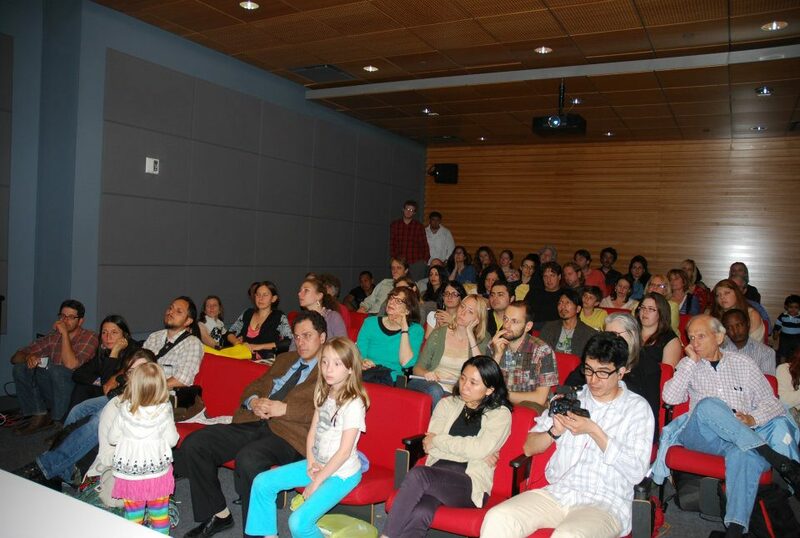 The May 17th event “Meet the Huaorani from the Amazon in New York City” was a success! Thank you to each one of you who came, who helped and who supported the event in any way. This event’s goal was to bring together and create a dialogue between two Huaorani leaders and the people interested in hearing their story, learning about their culture and life in the rainforest, and listening to how they are now fighting to defend their territory and human rights and attain self-determination. Penti and Cahuiya travelled by boat, by bus, and by plane all the way from the Amazon rainforest to come to New York City where for two weeks the United Nations Permanent Forum for Indigenous Issues took place. While in New York, the two leaders sought to raise awareness about their people and the issues they and their ancestral lands are faced with. This meet-and-greet event organized by Maloca gathered more than 70 people at the School of Visual Arts in Manhattan. The Huaorani opened the event by chanting a song in their language, Huao Terero. The song spoke of a lot of macaws that flew from all over the rainforest to a special place where there was a tree bearing lots of delicious fruits. For a few days all the macaws gathered at this special place to eat the fruits together as a family. Then, each of them flew back where they came. The Huaorani felt this song was fitted for this occasion. Then the Huaorani spoke to the public about their home, about their experience in New York, about their work and about their dreams for the future. The event started with a lively panel discussion. The Huaorani wanted to start the discussion with a traditional chant that fit the occasion. Law Professor Judith Kimerling, who also serves as international counsel for Ome Gompute Kiwigimoni Huaorani (the grassroot Huaorani organization of the communities living in Yasuni) was on the panel next to Penti and Cahuiya. She explained to the public in depth the situation of the Huaorani and their fight to protect what is left of their rainforest. The presentation and Q&A session was followed by a lively reception where all the guests could talk to Penti and Cahuiya, buy handcrafts made by the communities of the two Huaorani, look at a projection of images from the Yasuni rainforest (home of Penti and Cahuiya), enjoy refreshments and listen to a live band – Inti and the Moon. Hopefully the Huaorani of Yasuni made 70+ friends this past Thursday, who now know who the Huaorani are, how they live, what they fight for. We hope that everybody will spread the word to their friends and families and tell them about the Huaorani. Special thank you to Raul Paz Pastrana (MFA in Social Documentary Film at SVA) and David Bartecchi (Executive Director, Village Earth) for helping with the event.